An ethnobotanical study was carried out in four parishes in the Ngai and Otwal Sub Counties in Oyam district, Northern Uganda, where insurgency has been prevalent for the past 20 years. Documenting medicinal plant species used in treating various health conditions among the local people. Information was obtained from mainly the local population, the traditional healers and other experienced persons through interviews, formal and informal discussions and field excursions. Seventy one plant species were reported for use in the treatment of various diseases in the study area. These plant species belongs to 41 families, with Asteraceae being the most represented. Roots were ranked the commonest plant part used. Oral administration was the most frequently used route of administration. A total of 41 different health conditions were reported to be treated by use of medicinal plant species. Thirty nine percent of the recorded plant species were reported for treating stomach related ailments. The use of medicinal plants in primary healthcare is still a common practice in Ngai and Otwal Sub Counties. The trust they have is built on the curative outcome properties claimed, poverty and armed conflict that lead to inadequate healthcare facilities. The generation gap caused by the over 20 years of insurgency in the area has brought about knowledge gap on the usage of medicinal plant species between the young and the older generation. World wide over 80% of the people depend on medicinal plant species to meet their day today healthcare needs . Rural household of Uganda rely heavily on plant resources for food, fodder and herbal medicine . Tabuti  further asserted that savanna environment contains many plant resources of economic values such as foods and medicines. These resources are widely relied on by rural communities in developing countries because of inefficiencies in service delivery or because social services and goods are unaffordable. For this reason many people are currently resorting to traditional medicine for primary health care due to high costs in accessibility, cultural compatibility, self-reliance among others . They also employ herbal medicines because of cultural preferences and perceived effectiveness [4, 5]. Medicinal plant species form a main part of treatment for the rural poor. Traditional medicine usage in rural Ugandan population for day-to-day health care needs is close to 90% . Kamatenesi and Oryem  further reported that women and children form the bulk of the people reliant on herbal medicine. According to Katuura et al , malaria was reported to be the most common condition treated by traditional healers in Mbarara District. The use of traditional herbal remedies is encountered in both rural and urban areas in Mali and that traditional medicine is one of the surest means to achieve total health care coverage for African's population . Discourses on the future of traditional medicine in Africa and other indigenous societies often assume government recognition and integration into the formal health care systems . In certain areas in Nigeria, the only health care providers close to the people are the traditional medical practitioners . However, it should be noted that medicinal plant species have also been discovered to have other uses as some could be used as vegetables, fruits, trees and ornamentals . Health services in Oyam District are inadequate, and only 15 out of the 43 parishes in Oyam District have health facilities. Maternal mortality rate is still high because clean and safe deliveries are at only 14% because it is mainly the traditional birth attendants (TBA) who play a significant role . 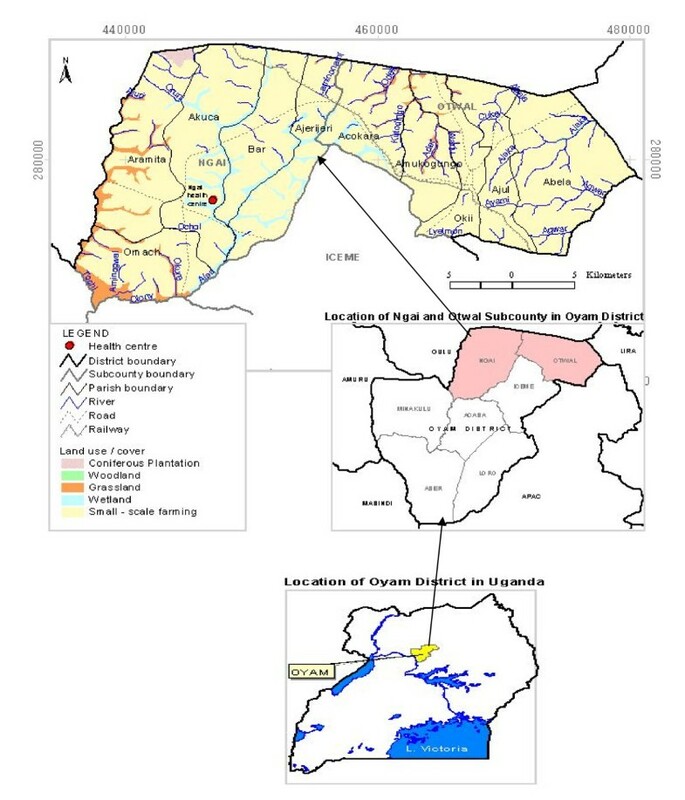 This study was carried out in Ngai and Otwal sub counties in Oyam District which is situated in northern Uganda on coordinates 02°14'N 32°23'E (Figure 1) . The sampling sites were located in the Parishes of Aramita, Akuca and Omac from Ngai Sub County and Abela from Otwal Sub-County. The study was conducted between August 2007 and February 2008 in Oyam District, Northern Uganda. Location of Ngai and Otwal Sub Counties in Oyam District in Northern Uganda. Ethnobotanical information was obtained through informed consent semi-structured interviews with key informants. The key informants consisted of health workers, renowned herbalists, and local leaders. However, the bulk of the respondents were local residents who were identified through household numbers. Knowledge on the use of medicinal plant species was documented, the local name of plant species, diseases or ailments they treat, part of plant used, methods of preparation and administration were recorded. In addition, a total of 84 households were interviewed using questionnaires, after being randomly chosen from the total household list from the LC I (Local Councilor One) chairperson. Forty four households from Ngai and another 40 from Otwal Sub Counties were interviewed through the use of questionnaire. Some questions asked included; village of respondent, level of education, knowledge on medicinal plant species among others. For more studies and information, three focus group discussions were conducted in Acandano village in Ngai Sub-County and Abela primary school and Ojwi centre in Otwal Sub-County. In this case the respondents were asked research guided questions. The groups comprised of children 15, women 20 and men 12. The groups participated voluntarily at the invitation of LC 1 chairman. The focus group discussion helped discover the extent of distribution of knowledge on medicinal plant species. Voucher specimens of the documented plant species were collected according to standard practice, including roots, flowers, and fruits where possible . Collection only involved samples that were identified by the respondent. The voucher specimens were delivered to Makerere University Botany Herbarium where further identification and classification was done. Scientific names of plant species were identified based on International Plant Name Index (IPNI: http://www.ipni.org). A total of 110 respondents were interviewed from the study area; 46 were females and males were 64 as shown in table 1. From the research findings, 71 medicinal plant species both wild and cultivated belonging to 42 families were documented and identified in the study area (Table 2). The family Asteraceae (5 species) was the most represented followed by Leguminosae and Lamiaceae (4 species) plant species each; Solanaceae, Poaceae, Eurphorbiaceae, and Zingiberaceae had 3 plant species in each family, and the remaining families had two and one species. With regard to growth habits, the plant species consisted of shrubs (39%), herbs and climbers (36.6%), trees (21%) and grasses (4%). Medicinal plants their habits, growth habit, frequency of mention, plant part used, diseases treated, methods of preparation and administration. Extract drunk two times a day, applied as nasal drop. Cyphostemma adenocaule Descoings. ex Wild & R.B.Drumm. These plant species were mainly obtained from open grassland area (41%), garden or farms (21%), homestead (13%) wooded grassland 11%, forest (7%) and least number was obtained from swamps (4%) and forest edge (3%). The most commonly mentioned plant species by respondents were Clerodendrum umbellatum Poir (25%) Securidaca longipedunculata Fres. (17%) while the least mentioned among respondents includes; Crotalaria ochroleuca G.Don, Albizia coriaria Welw (0.9%). Fifty five percent of the plant species mentioned were used to treat more than one disease and 45% to treat only one disease. A total of plant species documented, 25% were edible and formed part of local diet (Table 2). Fifty five percent of these were used in the treatment of more than one disease while 45% were believed to treat only one particular disease. The conservation status of the medicinal plant species is such that only 10% were cultivated and 90% were collected from the wild (Table 2). 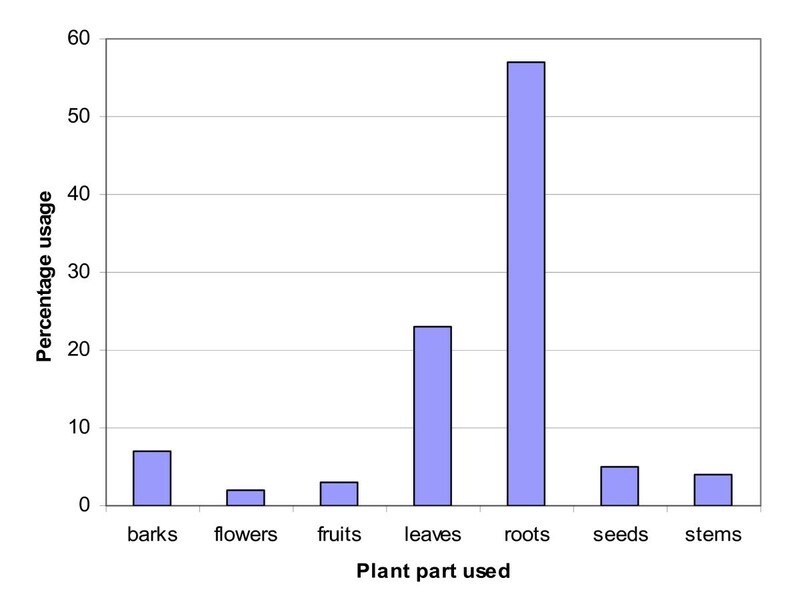 Roots were the commonest plant parts (57%) being used; followed by leaves (23%) (Figure 2). The most underutilized plant part were found to be flowers with only 2% usage, fruits making up 3% and the rest of plant parts harvested making up 4%, 5% and 7% of stems, seeds and bark respectively. Records reveal that a total of 41 conditions were treated with medicinal plant parts in Otwal and Ngai sub-counties in Oyam District. The common condition being treated in Ngai and Otwal sub counties was found to be abdominal pains and this was reported by 11% of the respondents, followed by cough at 10%. Other conditions such as wounds had 5.6% headache; epilepsy and STD/STI at 4.6%. Those least mentioned at below 1% were impotence, toothache, cholera, fever among others. The most common way of preparing these medicinal plant species was mainly by crushing and extracting using cold water making up an overall 48%. This was followed by crushing plant parts and applied in that form at 20%. The least mode was found to be burning, and adding the ashes into bath water making up less that 1%. On administration, oral administration through drinking was found to be the most frequently used at 69% and the least were through bathing with, massaging and smoking at less than 1%. The main sources of indigenous knowledge of medicinal plant species were parents at 40%, grandparents at 35% (Table 3). The least sources of information about medicinal plant species were through dreams at 3.8% and in-laws 2.9%. Source of knowledge on medicinal plant species among the people of Ngai and Otwal sub counties in Oyam District. The use of medicinal plant species was found to be driven mainly by its perceived effectiveness (34%), poverty, medical facilities being far (23%) and lack of medicines in hospitals (5%) (Table 4). The least use of medicinal plant species was due to referral from medical personnel (3%). The 71 medicinal plant species of cultivated and wild types were greatly utilized by people of Oyam District as herbal remedies. These plant species fall under 42 families, with the family Asteraceae having the highest number of medicinal plant species. The family Asteraceae was also recorded as having the most number of medicinal plant species as other studies in other areas also reveals [15, 16]. Clerodendrum umbellatum, Securidaca longipedunculata, Clematis hirsuta and Conyza sumaternsis were among the most frequently utilized species. The frequency of mention of a given plant species could be an indication of the prevalence of a given condition it can treat and its therapeutic values. Roots were the most commonly harvested plant part of the medicinal plants compared to any other part. This form of harvesting however, is threatening to the survival of the plant. Plant species such as Lantana camara, Urtica massaica had leaves and roots being harvested. Harvesting of two or more plant parts can be more damaging especially when the roots and barks/stem are harvested. Thus from the conservation point of view, the high utilization of roots of plant species in Oyam District put these plant species at a risk because of the damages inflicted on the plant species. This was also noted in other areas . Abdominal pain and cough were the most frequently treated ailments. These are diseases associated with personal hygiene. The study area has had IDP camps which was always associated with poor hygiene and over-crowding. The high frequency of mention of these diseases were directly associated with the high prevalence of these diseases in the area. This goes on to explain why many of the medicinal plant species mentioned were used for treating these ailments indicating widespread knowledge of medicinal plant species used for their treatment. For example, 25% of respondents mentioned that Clerodendrum umbellatum was used for treatment of abdominal pain. The most common method of preparation of medicinal plant species before being administered was found to be applied to most plant species. This involved crushing and extracting plant materials using cold/warm water and boiling. Those that were boiled were effectively extracted compared to use of cold water, since boiling also preserves the medicine longer. Oral administration was noted as number one mode of dispensing of herbal medicine. This mode of administration of herbal medicine was also reported elsewhere [6, 18]. Some of these plant species are popular and used all over Uganda and are on sale in most markets. For instance Cleome gynandra, Cajanus cajan, Vitallaria paradoxum, Capsicum frutescens were found to be sources of food and were being eaten not only locally but also nationally and internationally . Some studies carried out in and outside Uganda showed that some of these plant species were potent as medicine. A plant like Aspilia africana, is said to have high antiplasmodial activity . Some other plant species mentioned elsewhere as medicine include Cassia occidentalis which is used in Burkina Faso as stimulant . It should be noted that a high percentage of these plant species are harvested from the wild, but with no consideration for domestication hence threatening their existence. The plant species are being overexploited, and the rapid environmental degradation coupled with insurgency has put mounting pressure on the environment. This may lead to the disappearance of many species of medicinal plants of economic value. According to one of the local traditional practitioners, Okello Okiko, the use of medicinal plant species is becoming expensive since some of the plant species are hard to find and one has to risk going to restricted conservation areas to get the plant species. Since the knowledge comes at a price, many people are even too poor to pay for the herbalist services, hence a reduction in number of clients. The disappearance of medicinal plant species can also be attributed to over use, agricultural activities and insecurity. Domestication of medicinal plant species is probably not taken seriously. Some medicinal plant species which have been proved potent have been over used [4, 20]. The mode of harvesting which involves the use of roots also posed a threat to the existence of these plant species. In most of the plant species, their roots were being used. The 71 medicinal plant species of cultivated and wild types were greatly utilized for treating a total of 41 different ailments by people of Ngai and Otwal Sub Counties. Thirty nine percent of the recorded plant species were reported for treating stomach related ailments. The most commonly mentioned plant species by respondents were Clerodendrum umbellatum Poir (25%). Of the total of plant species documented, 25% were edible and formed part of local diet. The main sources of indigenous knowledge of medicinal plant species were parents at 40%. Roots were the most commonly harvested plant part of the medicinal plant species compared to any other part. The most common method of preparation of medicinal plant species before being administered was found to be applied to most plant species. However, it was noted that some of these medicinal plant species are disappearing very first. The disappearance of medicinal plant species can be attributed to over use, agricultural activities and insecurity. Domestication of medicinal plant species is probably not taken seriously. The use of medicinal plant species in primary health care is still a common practice in Ngai and Otwal Sub-County. The inadequate health services and abject poverty still make these people dependent on herbal medicine for their day to day health needs. The generation gap caused by the over 20 years of insurgency in the area has brought about knowledge gap between the young and the old with regard to medicinal plant species. There is need for community awareness and education concerning the values of medicinal plant species of the area especially among the young people. Further studies should be done on the medicinal plant species to determine their pharmacological potentials. Maud M Kamatenesi and Hannington Oryem-Origa contributed equally to this work. Our most sincere gratitude to the sponsor, NORAD Medicinal plant species Project through the Department of Botany Makerere University, The Staff of Ngai Health Center III, Field assistant, leaders of Lango Cultural Center, local leaders, traditional healers, traditional birth attendants, the resource users and all respondents, in Ngai and Otwal Sub counties in Oyam Districts who provided the information. AA identified the research area and title, collected field data, carried out statistical analysis and drafted the manuscript. MMK and OOH participated in refining the title, formulation of the research problem, data analysis and drafting as well as enrichment of the manuscript. All authors read and approved the final manuscript.